Snakes! Another sign of spring. Along with wildflowers and bird watching comes the responsibility to look where you put your feet when you are hiking in the Inner Canyon or other desert areas of the Southwest. 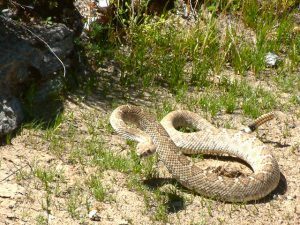 Just last week, a 5-year-old girl was bitten by a rattlesnake while walking in a dry desert drainage near Phoenix with her family. They immediately got medical treatment for her, and she is expected to fully recover. Yes, we do have rattlesnakes at the Grand Canyon. I have moved a few of them out of the campgrounds myself. This is why it is so important not to drop any food when you are snacking or preparing your meals. Not because the snakes eat the food, but the rodents those scraps attract do! Snakes are definitely attracted to rodents! So please be very diligent when eating and preparing food at your campsite. If you do happen to see a snake, remain calm and slowly back away from it. Our snakes do not chase you and truly do not want to have anything to do with you. If you accidentally get bitten by a venomous snake, here are steps of what to do. For more detailed information as well as a photo of a snake endemic to Grand Canyon, please visit my Snakes page. Remain calm, and retreat from the snake at least 10–15 feet. Arrange to have the victim transported to a medical facility as soon as possible. Remove restrictive clothing items (rings, bracelets, watches, buttoned shirts, etc.) from the victim. Splint or otherwise immobilize any bitten limbs, and keep them below heart level. If (and only if) the victim is more than 1–2 hours away from a medical facility, it is recommended to place a lightly constricting band (that admits one finger beneath it) above the bitten area to prevent the systemic spread of the venom. Keep victims calm; put them at rest; keep them warm and give them comfort and reassurance (which will lower their heart rate, slowing the spread of the venom). However, keeping a victim’s heart rate down should never interfere with getting him or her to a medical facility. In no case should tourniquets be used, nor should any incisions or suction be applied to the wound.